It has been almost a week since I’ve sold a single copy of any of my books in electronic format. If you know the world of indie publishing, you know this is not a good thing, especially at the holidays when, hopefully, people are buying more books than normal. Each morning, I open up the dashboards of the various places my books sell, and each morning, I see the line is steady at zero. I sigh, and then, by what is truly a miracle of grace, I realize it’s okay and go on about my day. It hasn’t always been like this for me, and it likely won’t stay this way always. See, I like to sell books, and I need to sell them as part of my living. So sometimes, I get this clench at the back of my jaw when my sales are slow, and I feel desperation clawing up my neck and down my arms. I want to post my books to all the sites in the world. I want to write emails and stand on street corners hawking my wares. Those things – in and of themselves are not bad. In fact, they are necessary for writers. But desperation is a sure sign for when I need to take a breath, make a cup of tea, and stare at the fire for a while. 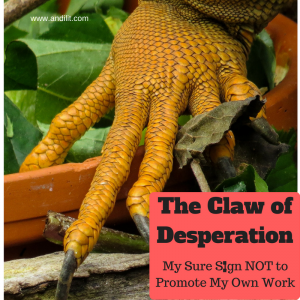 Desperation blinds me to things I normally know – like when I’ve posted too many times about my work in a particular group or on my own social media pages or when I’m missing out on a cultural moment of pain or joy in the midst of frenzy to sell. I’m learning – and will need to learn again and again – that what I need to do when desperation or panic or fear or that cloying feeling of “not doing enough” comes to the fore is to stop, step away, and trust. It’s kind of like the adage about meditation or prayer – when you feel like you don’t have time to do it is when you need to do it most. When I begin to feel like I have to do more and more to get sales or readers or subscribers or followers, I need to step away and trust that the people who need me will find me. That is such a counter-cultural move in 21st century society, where we believe that we can “make it happen” and where “doing the work” means you get everything you want. I KNOW that’s not true in so many ways, but I fall for that lie over and over again. When I do, I try to claw my way to what I want. It’s not pretty, and it makes me selfish and self-absorbed in a way that I do not love and I expect others do not love either. I share the work of as many other people as possible. I believe in literary citizenship, in the importance of sharing other people’s work as part of being a member of the literary community, so that’s part of why I share. But more, sharing takes me out of my own desperation and reminds me that other people have books and causes, needs and dreams, too. I write. When the sales of my published books are low, when I feel like I NEED to sell in order to be a success, I go back to the page and do the only thing I can control – I write. And of course, this is the thing I’ve needed all along – the work, the practice, the gentling of my thoughts and feelings onto the page. So if you sometimes feel that claw of desperation climbing up your back, know you are not alone. I don’t know a writer who doesn’t feel that sometimes. But then, get it off your skin by taking a break. Don’t give in to the feeling or the impulses it pushes on you. Instead, breath, love on another writer or two, and then go back to your work because we need it far more than we need you telling us about it. Do you ever feel that desperation? How do you handle it?